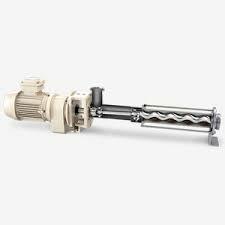 Progressive cavity pumps from Sydex are ideal for pumping viscous liquids or abrassive liquids. Because of the principle, namely "progressive cavity". (The rotor continuously pushes the product forward without compressing it), they are also suitable for shear sensetive products. Depending on the viscosity or the percentage of solids, these pumps can be fitted with conveyor or bridge breakers. The pump body and rotors are available in steel, cast iron or stainless steel, the stators in the most diverse types of rubber. Assembly "monobloc" or bearing bracket according to the application. Standard models are available for general industry and the food industry. Also available as a "barrel pump". Since the flow of these pumps at a certain speed is constant and reproducible, these pumps can also be used as a metering pump (see section "dosing").